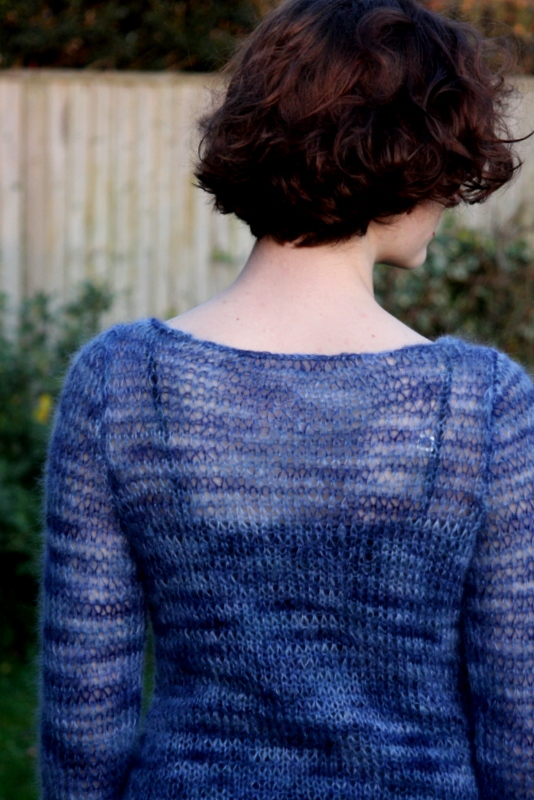 First, a confession; then, an FO (a Finished Object). I didn’t knit a single stitch for nearly three weeks. At the beginning of the month, I flew to Boston with Doug and the girls for a conference commemorating the 50th anniversary of the linguistics department at MIT. Doug and I met there 25 years ago when we were both PhD students in linguistics. Despite packing lots of knitting for the trip, I never even took it out of my suitcase. I was busy every minute in Boston, and enjoyed it immensely. When I got back to England, I was both jetlagged and extra busy trying to meet a handful of important deadlines before the holiday break; not only was I tired, but I seemed to have lost my knitting mojo. I carried my knitting around faithfully and ignored it completely. On Christmas Eve, well rested and happy, my knitting needles sprang to hand, and in five days I have finished a lovely sweater for Emma. 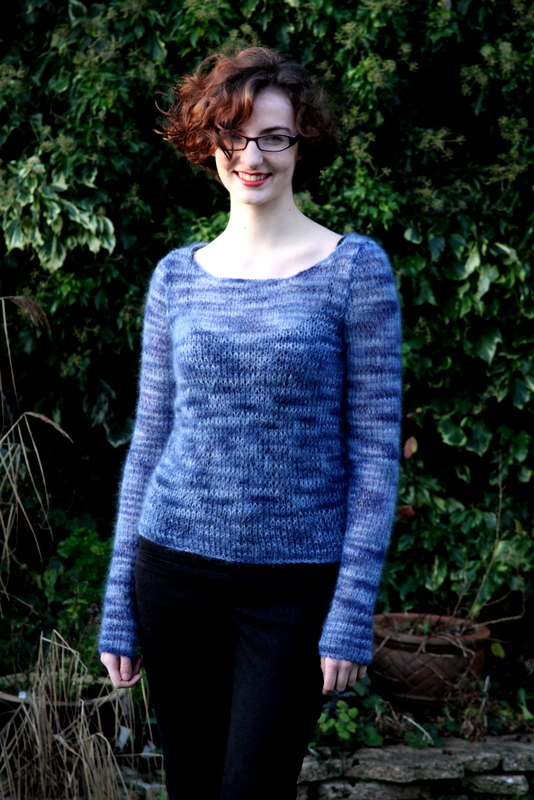 This is a design by Kim Hargreaves, called Smoulder. 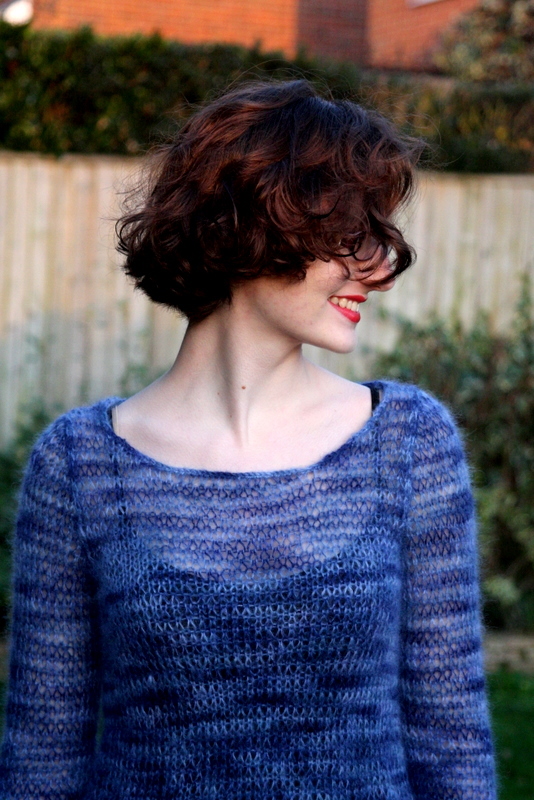 I actually started this sweater back in the summer, while on holiday in Italy. 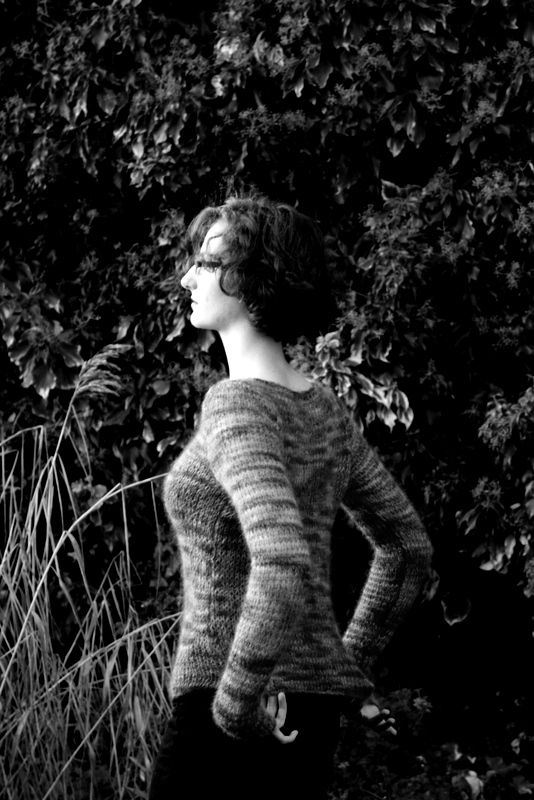 I knit the back of the sweater in one afternoon in Umbria, and then stuffed it away in a bag where it remained until Christmas eve. Then, realizing that I had weeks and weeks of work left to finish the Brick pullover for Doug, but wanting to finish one more garment before the year’s end, I pulled out Smoulder and began to knit. 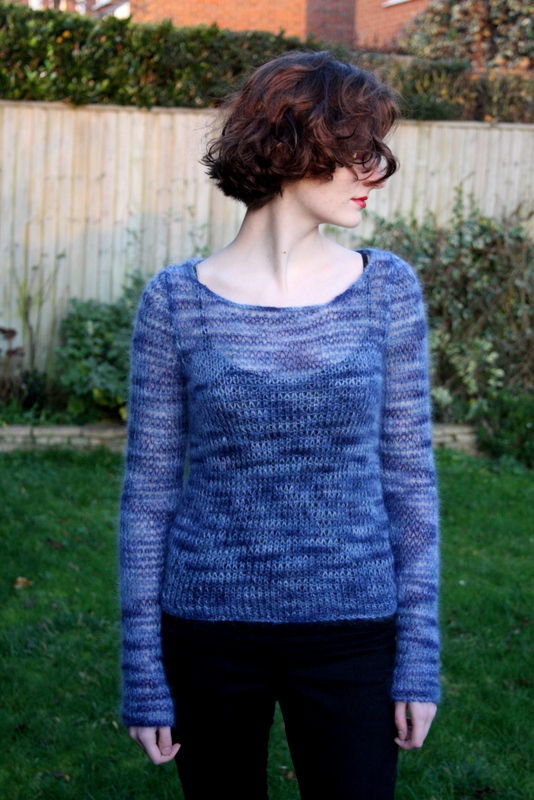 As you can tell from the above account Smoulder is a very quick knit. It is quite easy to knit in a week, two if you take your time. However, I really didn’t enjoy knitting this one. Smoulder is knit with two strands of Kid Silk Haze held together. The fabric is made by using two different size needles. 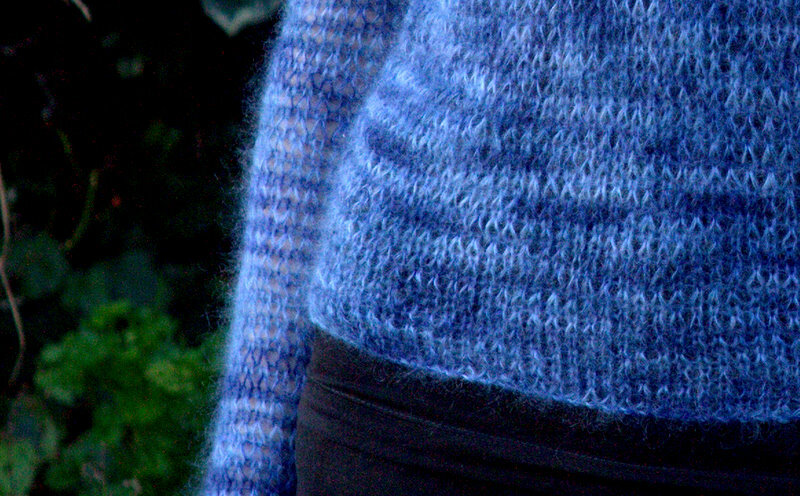 All of the knit rows are knit with a medium sized needle, and the purl rows with a very large needle – I used US size 15 and 8 for the body of the sweater and 13 and 7 for the edges. I found this really awkward and unpleasant to hold and knit. The fabric it makes is lovely and the knitting goes extremely quickly, but it didn’t feel nice to knit. Knitters are often divided into two groups – process knitters and product knitters. I think my experience with this sweater emphasizes for me once again that I am primarily a process knitter. I enjoy the rhythm of knitting, the feel of the needles in my hands, the wool in my fingers. I don’t get that when using gigantic needles, and especially when alternating every row between two different sized needles. However, one can’t deny that this sweater looks great on Emma. The fit is good, even without any shaping. I made it exactly to pattern (only increasing the needle sizes to get guage). This is the extra small size, and took exactly 4 skeins of Kid Silk Haze (I had about 7 meters left.) 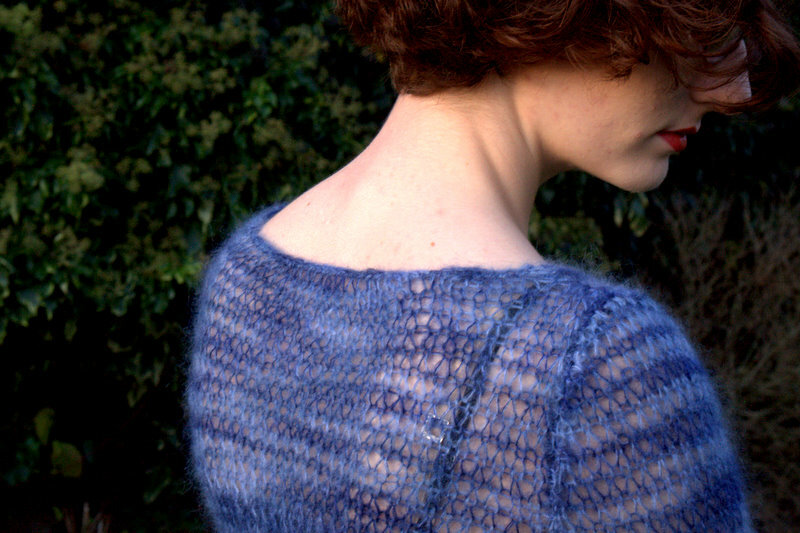 Thus, the sweater is not only fast and pretty, but also quite economical. 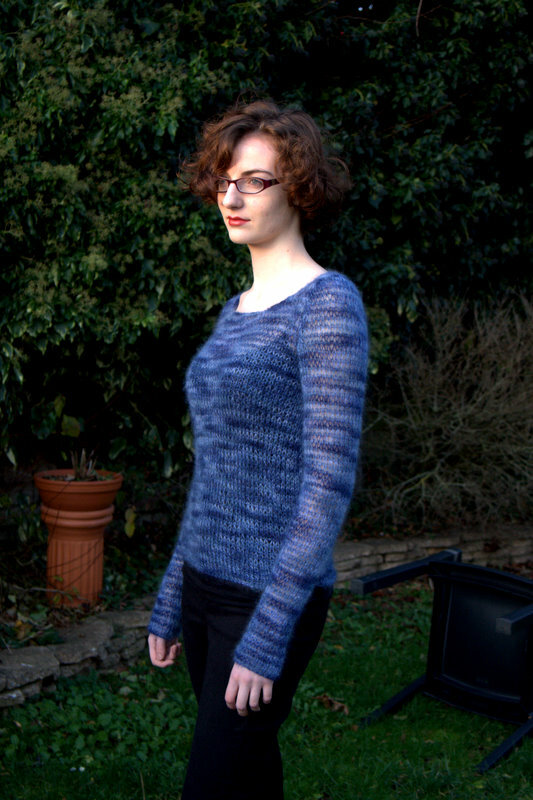 Since I bought this Kid Silk at an end-of-the-year bag sale at John Lewis last year, the entire sweater costs about £12 (and I have 6 skeins of wool remaining for another project).